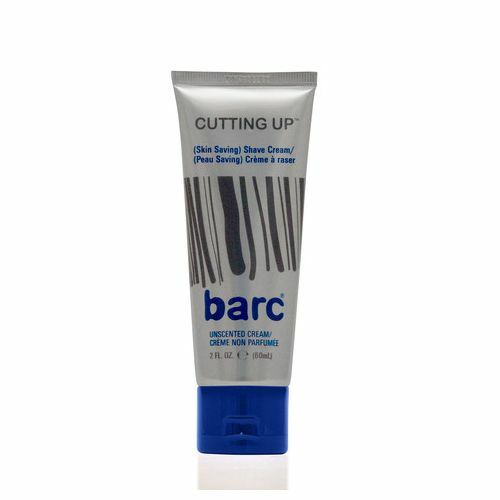 barc Cutting Up Shave Cream is an enriched shave cream that softens the hair to ensure a smooth shave. This thick shave cream is formulated with beard softener to help reduce shave bumps, boswellia serrata gum to prevent irritation and soothe the skin and glycerin to hydrate and nourish the skin. hydrate and nourish the skin. up with Barc Bump Down Razor Bump Relief. This is perhaps one of the best shaving cream that I've used in many years. It lotions up the face quite nicely and gives a extremely smooth shave. You can always expect a good result. Adding the Barc razor bump down after shaving just simply gives unbeatable result eliminating razor bumps. I tried this for this first time today and got a really nice clean close shave from it. It's unscented and therefore would be good for sensitive skin types I think. Recommended. Have tried both barc bump down razor bump relief and now this, barc cutting up shave cream. Really impressed by both products. Great value for money as both products go a long way. Shave cream has a luxurious creamy feel, leaves skin feeling moisturised and soft. Like masculine packaging also.